In our previous shop tip, Gwen provided an overview of derailleurs. In this tip, she will describe the two types of shifters. Integrated levers are shifters and brake levers combined into one mechanism. If you pull the lever towards the bar, it actuates the brake. If you push the lever or paddle to the side, it actuates the derailleur. Integrated shifters are always “indexed” and were made for 7-speed through 11-speed systems. There is an image of an integrated lever in a previous shop tip: brakes and levers. The other two types of shifters which are commonly found on bikes with drop-bars are “stem shifters” and “down-tube” shifters. Both types function and look much the same, but mount to different parts of the bike. They are located in the upper left half of the photo. Stem shifters attach to the stem, which is the piece connecting the handlebars to the rest of the bike. Down-tube shifters either have a clamp which wraps around the bicycle frame, or bolts which fit into threaded tubes that the manufacturer has placed on the frame. Stem and down-tube shifters can be either indexed or friction- and some models can even switch between the two. Most models were made to work with 5-speed through 8-speed systems. Bar-end shifters (pictured below) are, again, very similar to down-tube shifters, and are sometimes even interchangeable, given the right hardware. Bar-end shifters have a special mount which slides into the open ends of drop-bars and when tightened down, holds them securely in place. These shifters can be either indexed or friction and were made for 3-speed through 11-speed systems. Trigger shifters come in a variety of shapes and sizes, but all use a small spring to rebound their lever after the rider compresses it to shift. Some have two levers, some only have one- the trigger shifters in the photo are at the very bottom. 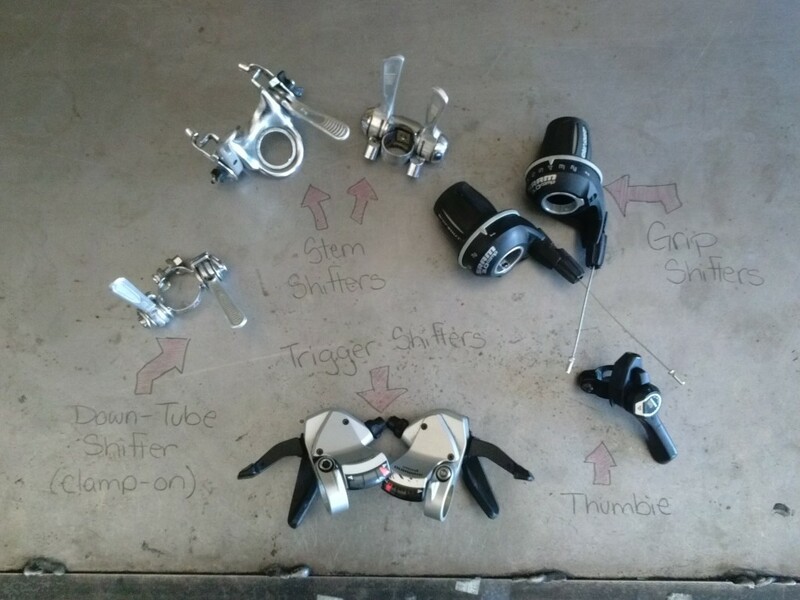 All trigger shifters are indexed. Thumb-shifters are a diverse type of shifters. Some are indexed, some are friction, and they are available for everything from 5-speed to 11-speed systems. Grip shifters use rotational force, rather than a pushing motion. 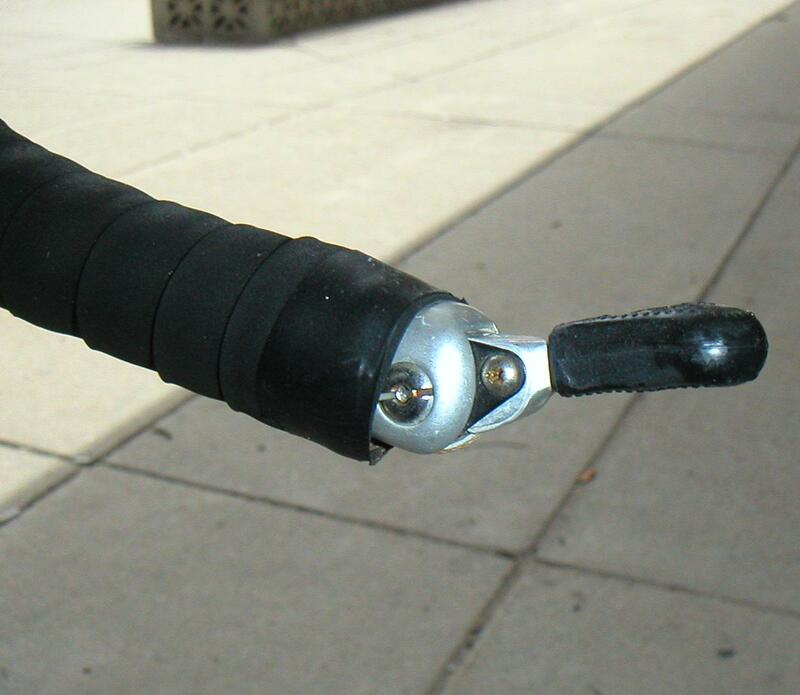 Grip shifters fit around handlebars and are held in place by a small bolt. They are always indexed and were made for 5-speed through 10-speed systems. Stay tuned for our next shop tip: how to adjust a front derailleur.